3 Winners of the Wishtrend Giveaway | Memorable Days : Beauty Blog - Korean Beauty, European, American Product Reviews. Hi all ^^ i'm back in The Netherlands and I have tons of things that I would love to share with you. But I would like to announce the 3 winners of the Wishtrend giveaway first. I noticed that a lot of you are suffering from acne and i know that it can be super hard to find the right product to cure it. 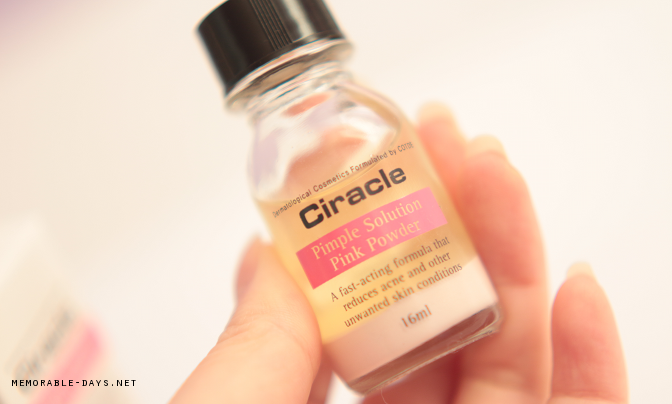 A lot of you wanted to give the pink powder from Ciracle a try and I really had a great experience with it. Make sure to visit Wishtrend.com if you are interested in the pink powder and order now since they have lots of deals going on! Feel free to use my coupon code MEMORABLEDAYS to get 5% OFF at checkout! They offer worldwide free shipping when purchasing for the first time! Anyways... lets announce the winners shall we? Congratulations! I will contact you soon and make sure to reply to my e-mail within 2 days, otherwise i will pick an other winner. Once again thank you all for joining and thank you Wishtrend for sponsoring this giveaway! Feel free to join my next giveaway which will be posted soon. Have a lovely weekend all! Ps. if you don't know what you should give to your loved ones for Christmas, check out these wishboxes full with korean goodies here, i'm sure your friend would like that as a gift! Wishtrend.com is also having a buy 1 get 1 free deal, don't miss out, check it out here.